I might have a lemon problem. I just finished telling you about a lemon-butter sauce, and now I’m on to lemon scones. Yesterday, I made lemon gelato. I’ve been adding lemon to cold tomato soup, putting preserved lemon in all kinds of salads, and lemongrass keeps appearing in dishes I’m making lately. Guess what flavor my birthday cake was earlier this year? So, I like lemon and so does Kurt, and we both like scones as much as we like lemon. Given that track record, it’s hard to believe I hadn’t tried this recipe sooner. I picked up the Baked book the other day, looking for something interesting for weekend breakfasts, and there I found Sour Lemon Scones. If my lemon problem initially sounded crazy, then it’s about to get worse. You see, there’s an optional ingredient in these scones. Yes, I said optional. As an option, if you so choose, you could add chopped candied lemon peel to the scone dough. My first thought was that I’d call a few local stores, ask if they have candied lemon peel since I never see it when I’m shopping, and if I located it, I’d use it. If not, it was optional. After hearing multiple times that it’s not available because it’s only stocked during the holiday season, that word “optional” started getting blurry. 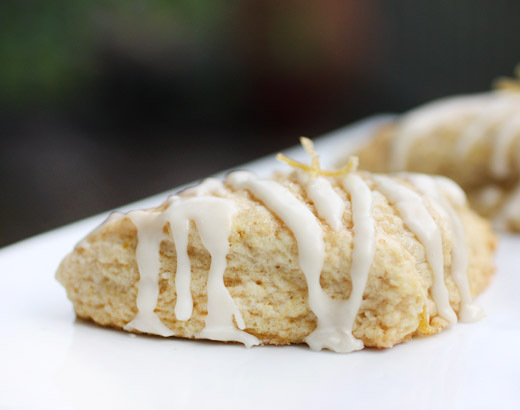 I became convinced that it was absolutely necessary that I try these scones with the candied lemon peel included. I bought some organic lemons, peeled them, and made my own candied lemon peel. This could definitely be a lemon problem. It’s not entirely my fault for going out of my way to make candied lemon peel. The recipe for making it is right there in the book. To quote the scones ingredient list: “1/2 cup diced candied lemon peel, optional (recipe follows)” I had to make it. I did only make enough for the scones though. I peeled a couple of lemons, and I always use organic when I’m using the peel or zest. The peels were placed in a saucepan with cold water, brought to a boil, and drained. This was repeated two more times to remove some of the bitterness. Then, the drained peels were placed in a saucepan with two cups of water and a cup of sugar, and I left it to simmer for almost an hour and then turned off the heat. The peels were left in the sugar syrup until cool enough to handle, and then they were cut into strips and returned to the syrup. You can store the strips in the syrup in the refrigerator for a few days, or after a few hours, you can removed the strips from the syrup, roll them in sugar, and leave them on a cooling rack to dry. I left them to dry overnight and made the scones the next day. The scone dough was a mix of flour, sugar, baking powder, baking soda, salt, powdered ginger, butter, egg, buttermilk, and lemon zest. I used a mix of all-purpose flour and whole wheat pastry flour. 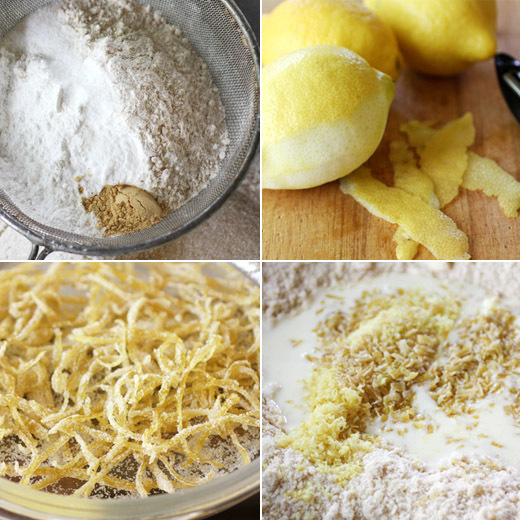 After the butter was cut into the dry ingredients and the egg, buttermilk, and lemon zest were added, the chopped candied lemon peel was folded into the dough. Just before baking, the scones were brushed with buttermilk and sprinkled with turbinado sugar. And, when they were baked and cooled, I couldn’t resist drizzling them with a lemon and confectioners’ sugar glaze. It’s possible that my brain was too busy thinking lemon, lemon, lemon, but I really barely noticed the ginger. I’m wondering if grating a little fresh ginger into the dough would be interesting next time. But mostly, I’m thinking about how deliciously lemony they were, and I’m delighted there are still a few in the freezer for another day. Divine! Lemony treats are just so awesome. Lemon is one of my top food lusts, too. Just love the flavor. We're currently eating a batch of lemon shortbread my wife made this weekend. I've never made candied lemon (or any fruit) and it certainly seems to be a simple process. Good post - thanks. and now i'm craving something lemon! These would be perfect with my cup of tea. Love the icing :) NoM! Love tangy lemony treats any time! Lisa, these scones look mouthwatering! I love, love, love lemon flavour!!! Please send some over. is a lemon problem really a problem? i would argue that it is not. :) these scones look lovely! I haven't made scones lately - thanks for the inspiration. They look great Lisa. I'm not sure there's any such thing as a lemon "problem". You can never have too much in my opinion! I would totally have made the candied peel myself also. I wouldn't be able to resist the challenge! As a fellow sconehead (I know, terrible joke) these look delightful to me! And I've never met a lemon dessert I didn't like so these scones are clealy a winner in my book. I'm sure the candied lemon peel was well worth the extra effort, too. You sound like me. I love all things lemon! I use it almost as much as salt in seasoning things like soups, sauces, and more. But in desserts? Yum! I am definitely going to try something like this soon. I also love lemons. I just looked in my fridge, and sadly, I have none! I must go out and buy some! This looks too good, I LOVE scones! Never made lemon scones, though - that experience is missing! I also have the same lemon problem! Almost all my baked goods have at least a touch of citrus to balance the sweetness. 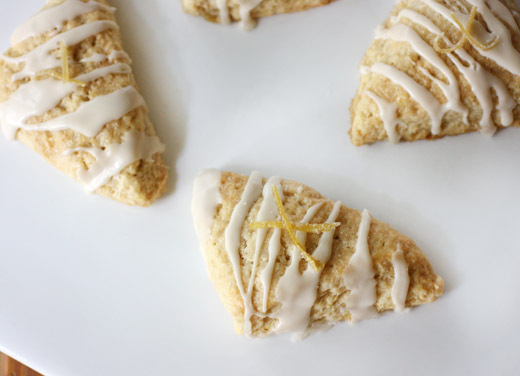 These lemony scones would be most welcome at my house! Time for another Amazon order, I need Baked! I love lemons, I use it everyday in almost anything. These scones are gorgeous!!! and so is the candied lemon peel . We're citrus freaks. Lemon zest and/or juice goes into everything. Preserved lemons are pretty awesome with chicken and fish too. You are not to blame for going lemon crazy! I'm a lemon lover too, especially in desserts and breads. These scones are perfect, light and fluffy and cakey. I am so trying these! I love scones! They are my go-to breakfast treat. I rarely make lemon and I'm not sure why. I need to try these! I just bought a bag of lemons at Costco, so bring on the lemon recipes :) These look delicious! these look lovely and i've made similar scones before and they're soooo delicious :) you've done a much better job with the icing hehe ~ YUM!